Inaugurated in the year 2000, at Noida (Uttar Pradesh, India), we “Sharad Textile” are the most trustworthy manufacturer, trader and supplier of a comprehensive assortment of Ladies Suits, Designer Ladies Suits, Ladies Unstitched Suits, Ladies Party Wear Gowns, Ladies Fancy Churidar Suits, Ladies Unstitched Dress Material, Designer Lehenga Choli, etc. The offered fancy assortment is widely appreciated by our clients for fashionable design, fine stitching, alluring patterns, attractive looks and shrink resistance features. The offered range of dresses is designed using the premium quality fabric and embellishments under the strict surveillance of our experienced designers who holds immense experience in this domain. 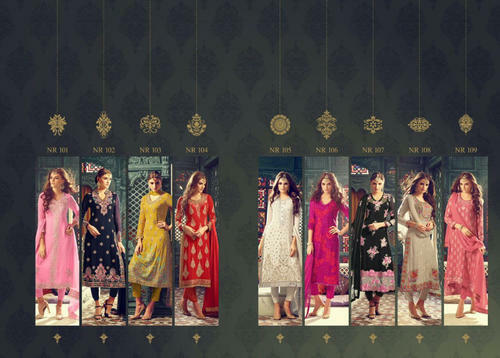 To cater various demands of our esteemed clients, we offer this fancy assortment in varied designs, colors and patterns that enhance the value of their wardrobe. Besides, we also provide a premium quality assortment of Designer Blankets that provide high warmth & comfort. In addition to this, our esteemed clients can avail this range from us at the most reasonable prices.